For generations, there have always been Blue Angels, that tiny, select group of Navy pilots that are there at the very top of the aviator kingdom. And for anyone who has ever seen the Navy’s Flight Demonstration Squadron perform, you KNOW there can be no disputing that first sentence. This coming year, the Blue Angels are scheduled to perform 66 demonstrations at 35 air show sites throughout the United States, celebrating 20 years of flying the Boeing F/A-18 Hornet. The Navy’s top “Top Guns” have been around for decades now, and are quite possibly the most visible part of our armed forces. They provide key public exposure and work to create a positive image of military aviators in all branches. At the end of World War II, Chief of Naval Operations, Adm. Chester W. Nimitz, ordered the formation of a flight demonstration team to showcase naval aviation. The team performed its first flight demonstration less than a year later, June 1946. Flight Leader, Lt. Cmdr. 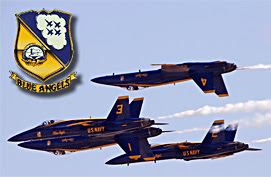 Roy "Butch" Voris led the team flying the at Craig Field at Naval Air Station (NAS) Jacksonville, Florida. * 10 Naval Air Facility El Centro, Calif.
* 17-18 Davis Monthan Air Force Base (AFB), Ariz.
* 24 Tyndall AFB, Fla.
* 31 MacDill AFB, Fla.
* 01 MacDill AFB, Fla.
* 21-22 MCAS Beaufort, S.C.
* 05-06 Offutt AFB, Neb. * 12 Seymour Johnson AFB, N.C.
* 19-20 La Crosse, Wis.
* 23 U.S. Naval Academy, Md. * 09-10 Tinker AFB, Okla.
* 23-24 North Kingstown, R.I.
* 30 Battle Creek, Mich.
* 01 Battle Creek, Mich.
* 14-15 McConnell AFB, Kan.
* 21 Pensacola Beach, Fla.
* 01-03 St. Louis, Mo. * 08-09 NAS Oceana, Va.
* 06-07 San Francisco, Calif.
* 03-04 Jacksonville Beach, Fla.
* 09-10 NAS Pensacola, Fla. Since its inception in 1946, the team has flown for more than 393 million fans. You really ought to add yourself to that list in 2007 if you live near a city where they will fly.